I receive your Totally Target emails and also follow you on Facebook. Thanks for all your awesome giveaways! Thanks for another chance to win!! Love Totally Target! I would love to win this giveaway, thank you! I love Target! and TotallyTarget!!! I already “like” you too! I already like Totally Target on FB and I subscribe to the emails. Thanks for this giveaway! What I cute gift card. I am following Totally Target on Facebook! This would be great to use for my soon to be grandson! I am a Totallytarget.com addict!!! I would love to win! Now I am following you via email also! I already love your FB posts. The card is so cute! I hope I win! I love these cute little cards! Love to win one! 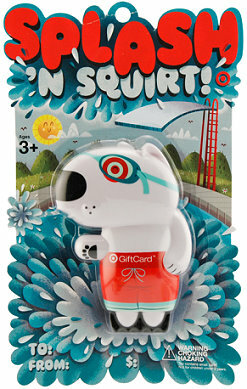 This is such a cool giftcard! I like Totally Target on Facebook, too!! This is so adorable! Thanks!! I Like you on Facebook and receive email updates. Splash away summer savings. Thanks for the giveaway! This is so cute…I could definitely use this! Thanks for all the help…love the ‘cheap finds’ tab! This si perfect for summer in Southern California!